My corporate job did not provide an extravagant income. It was probably less than industry average. This was not a realization over time - getting rich was never a reason to take the job in the first place. Budgeting and planning was made easy due to this consistent monthly income. Yet that simple fact was a poor reason to continue in an unhappy situation. As my job satisfaction diminished, I began plugging scenarios into a spreadsheet, using various hourly rates and annual hours worked. I asked myself what expenses I could cut to make my budget lower profile. At first the resulting numbers concerned me. The largess of my necessary expenses surprised me. A bit of a depression phase ensued. I wished I had never worked corporately, that I had never become accustom to living with two cars, a house, and piles upon piles of Stuff. I imagined prison walls built out of stacked DVD’s, furniture, and electronics, with framed equity and debt statements as the only decorative flourishes. Since my responsibilities necessitated a certain level of income generation, the task of leaving corporate life required analysis of my (and my wife’s) risk tolerance and testing of my ability to predict the future. While I carried debt in the form of a mortgage, car payments, and student loans, I found our situation better than bad. First, I had recently established an emergency fund. This offered me protection in the form of tide-me-over money in case of disaster while my income dipped below the norm. Second, I carried no credit card debt. Zero credit card debt was obviously helpful in that I had zero credit card debt to pay, nor interest to incur. Less obvious is if money ever became tight I basically had pre-approved loans up to my credit limits to keep my family in house and home (and car and diapers and ramen noodles and so on). I am not recommending a dip in the ice-cold waters of one’s emergency funds as a means to make a corporate departure possible. Nor am I suggesting incurring credit card debt is the way to go. But this bit of buffer, this bit of protection, eased my mind as I considered the possibilities for my career. If the budget does not work, it simply does not work! There is no shame in working on the side to establish oneself in an alternative career. I would probably recommend the moonlighting route as opposed to the route I took. After taking my risk tolerance temperature, I was at a point where I preferred tightening the purse strings to delaying a career change. To be sure, I needed to secure paid employment at some juncture over the next six months. I calculated the lowest possible amount I could make in the remainder of the year in order to cover my needs. The scenarios I devised were plausible, and even allowed me to develop a pecking order for potential work. At this point I was fairly secure in my abilities to get another corporate job if the “real world” became too difficult. I was only able to make this jump into the freelance world by taking the time to research my budget, address my risk tolerance, understand the income I truly required, and consider ways to reduce my required income. Once I truly understood all of these factors, leaving the every-two-weeks checks behind was not all that scary. Growing confidence in my abilities did not hurt my comfort level, either. Here’s where I share my secret, my ace-in-the-hole. I had another safety net. My wife was working a good-paying job with options to increase her hours if the need arose. It really helped me to have a supportive (in more ways than one) spouse! Oh, and one other thing. 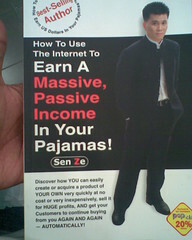 My potential income is now much greater than it ever was in the corporate world.